With the scope of influencer marketing ever growing, Sideqik is excited to announce we now support Pinterest Analytics. This new feature allows brands to continue to grow their sphere of influence and partner with creators on another platform. In addition to Facebook, Twitch, Twitter, Instagram, Mixer, Tumblr, YouTube, and blogs, we’re adding Pinterest analytics so you can see the full picture of your influencer marketing efforts. As our CEO Jeremy Haile noted after visiting the Pinterest creators conference last year, Pinterest’s content lasts longer than other social networks, making it a great long play for your influencer strategy. Comparatively, most of a post’s engagement on Twitter takes place in the first 17 minutes, and on Instagram, it’s within the first 12 hours. However, posts on Pinterest can continue to drive traffic for years to come. This makes Pinterest more similar to a blog post or YouTube video in some respects, and the full value of an influencer’s content may not be apparent in the first few days or even the first month. Pinterest has pins from 2015 that are still getting 3 million views per month! Beyond the longevity of Pinterest content, Sprout Social reports that 93% of Pinterest’s 200 million monthly users said they use the network to plan for purchases. That’s a lot of buyer intent! Since pinners are already looking for a recipe to cook, a craft to try, or a fashionable look to emulate, it’s easier to market to them through influencers in a way that doesn’t feel like spam. Pinterest users rely on pins to help them build a sense of style, inspiration, or aspirations. By working with Pinterest influencers in your brand’s space, you can authentically talk to your fans in a setting that is natural. Unlike other social media channels, where branded content serves mostly as an introduction, Pinterest is where people are looking for things to purchase. In fact, Pinterest reports that 73% of pinners welcome branded content on their boards. You’re speaking to your audience where they’re looking for you with the intent to buy. Because Pinterest users already have the desire to purchase when heading to the site, influencer campaigns on Pinterest can be more focused on the bottom of your funnel. Our platform now pulls Pinterest posts, including media and captions. Pinterest posts are categorized and searchable according to their topic, what brands are mentioned, and post sentiment. If you’re looking for engagement, Sideqik can help you find relevant Pinterest influencers and tell you how many saves or repins a post received, and estimated impressions. When searching for influencers in Sideqik, Pinterest pins are visible when you perform keyword searches. And when you find an influencer who piques your interest, you can now see profile-level aggregate stats for Pinterest for each influencer, including pins per week, average engagement, average earned media value, and reach. 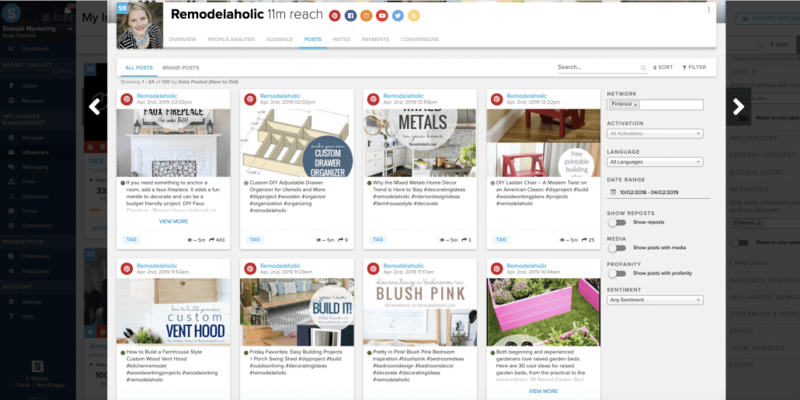 Pinterest has always been a vital social network and an important strategy for influencers in a number of industries including travel, fashion, food, DIY and home improvement, and lifestyle. “Pinterest is a long-term strategy. You don’t just pin something once. You pin it for months, always trying to get the content out there.” said Julie Fain of the popular DIY blog Tag and Tibby. She uses Pinterest to promote her collaborations with home improvement brands like Sherwin-Williams, World Market, and Hunter Fan. Reach out to learn more about what insights Sideqik can give you across social networks. How to measure ROI in influencer marketing Influencer Network or Influencer Marketing Platform: Which Do I Need?